Looking to try something new? 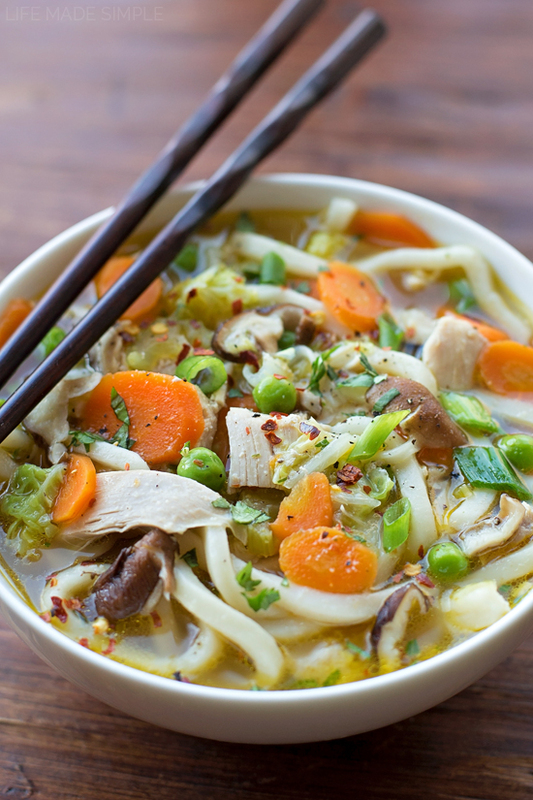 This cozy, comforting Asian chicken noodle soup is a flavorful twist on a classic. Just because the weather is warming up, doesn’t mean soup is off the menu… or at least that’s the case at our house! If you’ve browsed through the “soup” category of my recipe index, you can probably tell that I’m a tad bit obsessed with soup. 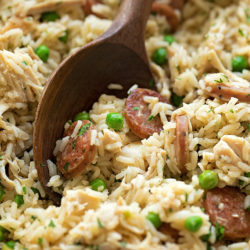 I love the challenge of coming up with twists on family favorites. I mean, that’s kind of what makes soup so awesome, right? You can add just about anything you want and it always comes out tasting delicious. 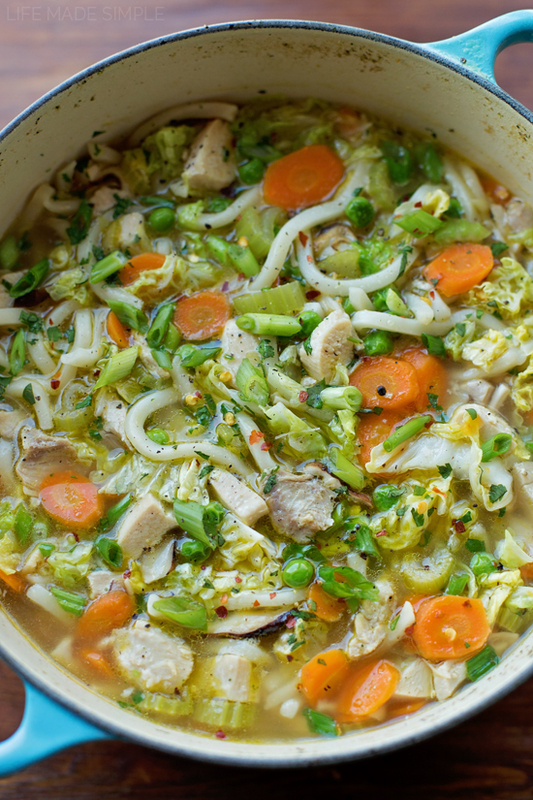 This Asian chicken noodle soup is a tasty version of my homemade chicken noodle soup, and let me tell you, it’s going to be a regular around here!! ???????? 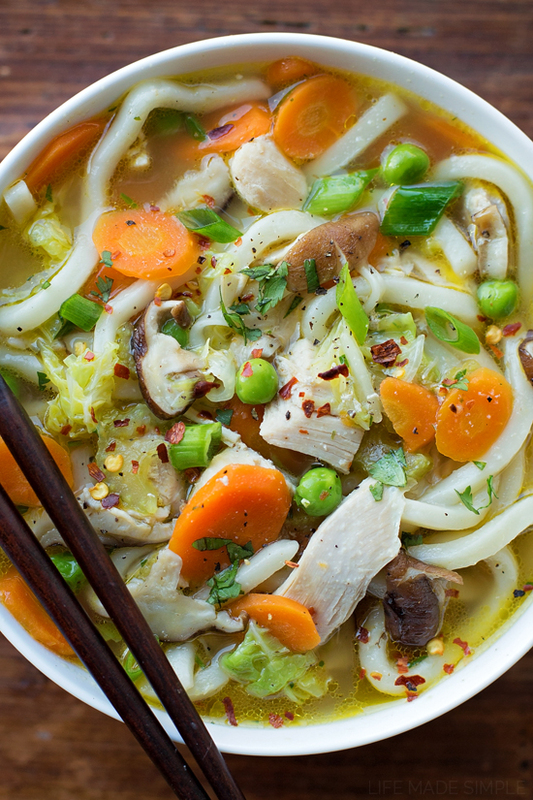 I love all of the flavors (and veggies) that are crammed into this soup. It totally hits the spot! I also love that it comes together in less than an hour, and can easily feed a crowd. All big bonuses when you’ve got two little ones (and a husband) waiting patiently to be fed! To start you’ll saute up the veggies (which are totally customizable btw –> p.s. am I the only one with a toddler who loves mushrooms? ), add the chicken, then pour in the broth and seasonings. After the chicken is fully cooked, remove it, shred it and toss it back in along with the peas, cabbage, green ends of the onions, and noodles. You’ll want to save those three veggies for the very end so they don’t get overcooked. Now let’s talk noodles for a minute. I’ve used both udon and yakisoba for this particular recipe, but even those hard little packets of ramen noodles would be great too! If your resources are limited, I’d suggest using something like spaghetti or bucatini. After simmering for a few minutes, remove the pot from the heat and stir in the cilantro and red pepper flakes. 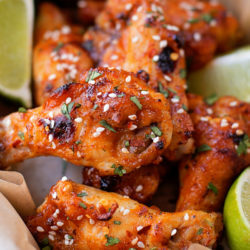 These are two optional ingredients but they add a ton of flavor! I went really easy on the red pepper, dished up some for our kids, and then added some more for us! ???? We slurped this up in no time. It’ll definitely be making its way into our regular soup rotation. I hope it’ll make it into yours too! You're going to love this tasty twist on a classic! 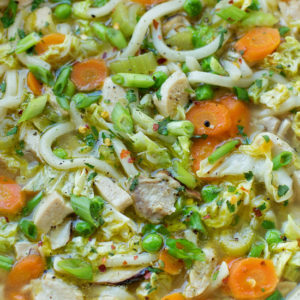 This Asian chicken noodle soup is bursting with flavor and loaded with chicken and veggies. In a large stock pot or Dutch oven set over over medium-high heat, add the olive oil. When the oil is hot, add the carrots and saute for 3 minutes, then add the mushrooms, celery and onion, Continue to saute for 2 minutes, then add the garlic and ginger and cook for 2 additional minutes. Add the chicken thighs, then turn the heat down to low and slowly pour in the warmed broth. Add the soy sauce, rice vinegar, sesame oil, salt and pepper. Return heat to medium-high until the liquid boils, then reduce to a simmer. 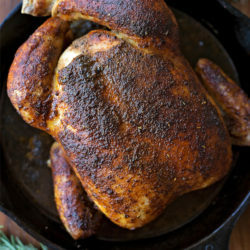 Cook for 25 minutes, then remove the chicken and transfer to a cutting board and shred. Return the chicken to the pot, along with the peas, cabbage, green ends of the onions, and noodles. Cook for 8 minutes then remove from heat. Stir in cilantro and red pepper flakes, if desired. *I use 1 can and 1 septic box of low-sodium chicken broth (6 cups total) and pour them into a large microwave-safe bowl and warm it in the microwave for 1 minute on HIGH.